Sébastien Miraux’s footsteps bring him to Mauritius’ sandy shores. Sébastien Miraux was born with a silver spoon in his mouth, only this spoon was used for creating culinary treasures in Paris’ 15th arrondissement, where he was born. His father was (and is) a chef, and Sébastien, in true Gallic fashion, has followed in his pater’s footsteps. 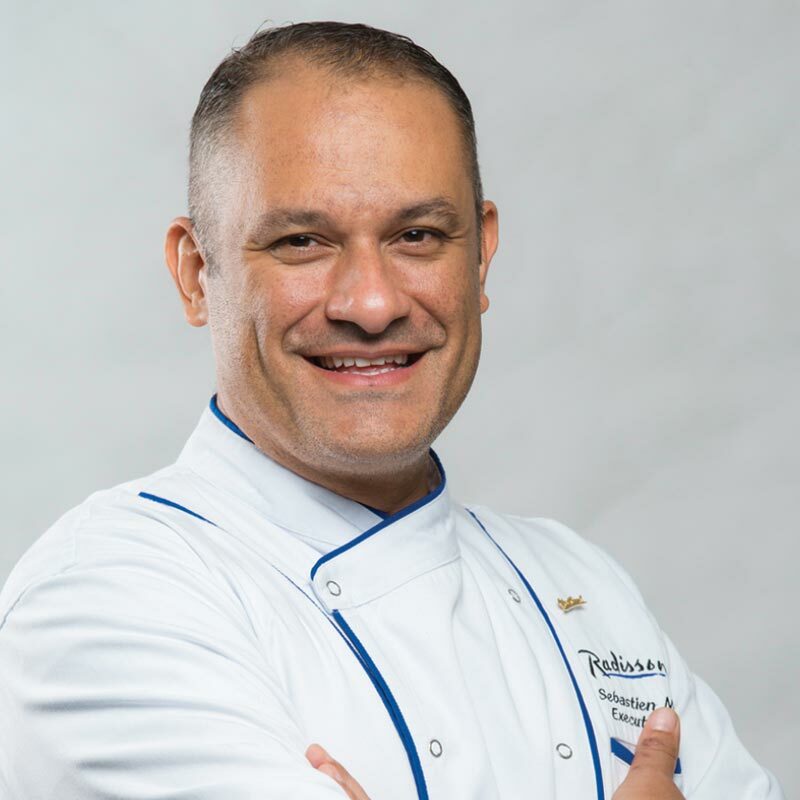 The Executive Chef of Radisson Blu Azuri has developed his own CV over the years, one that will tickle your salivary glands until you sate your hunger at L’Azuli. His background originates in the restaurant business, and oh, what hallowed ground it covers. Le Taillevent of Paris – granted 3 Michelin stars in 1973 – was Sébastien’s first call, and where he started his training following studies at the Ecole de Paris des Métiers de la Table (EPMT). He journeyed as a prestigious Compagnon du Tour de France, touring the country to perfect his trade, learning to excel in all he endeavoured, and to share and transfer his own knowledge in the field of gastronomy. This period lasted 14 years, proof that a chef’s experience is honed through persistence over many long hours, days and years. His first sojourn outside metropolitan France was a promotion that took him to the Belvédère of Porto Vecchio (Corsica), where he continued as a compagnon, followed by a stint with the renowned Christian Troisgros at Roanne (Lyon), before setting off for Brazil in 2005, his first overseas challenge. From there, Sébastien’s steps grew longer, taking him to his first hotel experience at the Sofitel of Bora Bora, then Bali, and finally to the Indian Ocean doorway that is Mauritius. On our shores, Sébastien Miraux has moved from the Véranda Group to Sofitel Impérial to Domaine de St Antoine and is now gracing the east coast’s own corner of paradise here at Azuri. Indeed, the chef’s path has been a circuitous one, changing every 3-4 years – which, as he says, is essential to “keeping up and evolving along with new trends”. Radisson Blu intends on benefitting from his talent and creativity every moment he spends here. …And so should you – make your reservation today to dine at L’Azuli, and enjoy a culinary trip around the magical Mascarene Islands under the stewardship of Sébastien Miraux.